"Tony, you just ate 1200 calories worth of bread." I rediscovered Jim Lahey’s no-knead bread recipe a couple weeks ago. It was Wednesday evening and there it was, idly sitting in my RSS feed, waiting to be double-clicked: Faster No-Knead Bread. Mark Bittman had just blogged about a quicker variation of the original recipe he featured in the NYT in 2006. I never got around to making this bread when it first came out. 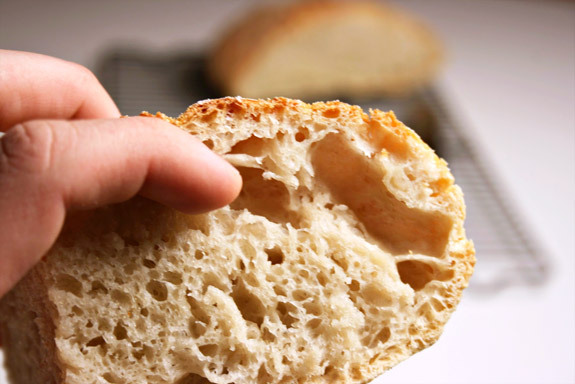 Originally, I sided with the skeptical foodies who wanted no part in this trendy no-knead fad. For me, the foundation of bread was all in the traditional kneading techniques and no post in the NYT was going to change that. But, many successful minimalist recipes later, Mark had made a believer out of me. I took Mark’s recent post as a sign of divine culinary intervention and decided to give this no-knead method a try. Before I could experiment with any quicker variations though, I thought it would only be right to try Jim’s original 24-hour, no-knead recipe, first. There was no mise en place, or anything of that nature. Like I said, it was a Wednesday evening, after work, and I was only surfing the web to procrastinate my inevitable visit to the gym (nothing unusual). I went down to the kitchen, mixed the flour, water, yeast and salt, covered it and went about my workout. I couldn’t concentrate at work the following day. I was eager to see if time had done its job in creating the much desired gluten proteins that usually require 15+ minutes of intense kneading to develop. As soon as I got home and stepped foot in my kitchen I was greeted by the intoxicating aroma of yeast belch – it was glorious. After 18 hours I uncovered the well-rested dough and took a deep breath of the bakery scent that was being propagated from within. The next step in the recipe was to invert the dough onto a floured surface and fold it onto itself. Then I placed it seam side down onto a cornmeal dusted cotton towel and allowed it to enter its final rising stage, just like in the video. This time, I was able to make it to the gym without any resistance – I knew that as soon as I got home, I would be less than an hour away from carbohydrate heaven! I pre-heated the oven as soon as I got home from the gym and immediately hopped into the shower so as to not disrupt the final rising stage. After 45 minutes of baking in a 550 degree oven, I was rewarded with my most successful loaf of homemade bread. I was like a proud father. I embraced my inner bread geek and admired the crispy crust and delicate crumb structure of the bread. Apparently none of my friends know what I am talking about (ahem, ahem, Mike), but crumb structure refers to the different size pockets of air inside the bread; the more of those there are, the better. I couldn’t leave you guys without a mise en place photo though. 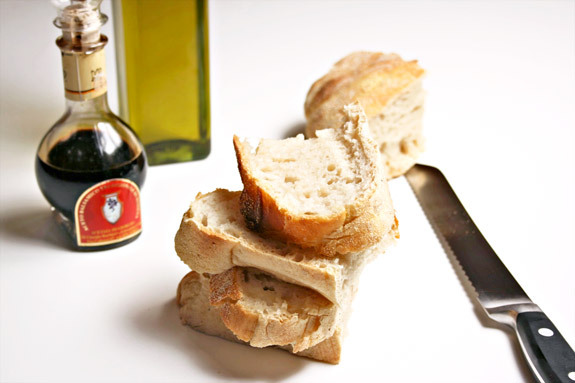 In celebration of all things minimalist, I decided to enjoy the bread with some high quality extra virgin olive oil and traditional balsamic vinegar that I brought with me from Modena. This is not the usual balsamic that you’ll find on the shelf of your local grocery store. At about 80 euros a pop, this stuff is as close as you can get to liquid gold. Traditional balsamic vinegar from Modena is only produced by a select number of families that have passed on the tradition from generation to generation. I got my bottle from L’Acetaia di Giorgio, where they invited me for an afternoon and showed me the entire process for making their vinegar. While I was there Giorgio showed me a batch that he started 22 years ago that he named Carlotta, after his daughter, which he will later use as her dowry – a tradition amongst most balsamic vinegar producing families. If you’re planing to go to Italy in the near future, I definitely recommend contacting Consorzio di Aceto Balsamico di Modena (CABM – the association for balsamic vinegar producing families) who can then put you in touch with one of their members for a private tour. This is one of my favorite ways to enjoy bread right out of the oven. Hence the quote from my friend Jess who, “for fun”, calculated how many calories of bread I had eaten in a two-day window. I figure it’s all good because I work it all off at the gym… right? Have you guys tried any of the no-knead recipes? What have your experiences been with the bread? Send me links to your post if you’ve blogged about it, I’d love to read some of the variations! In a large bowl, combine the flour, yeast and salt. Add the water and stir with a wooden spoon until blended. Cover the dough and let rest from 12-18 hours at room temperature. 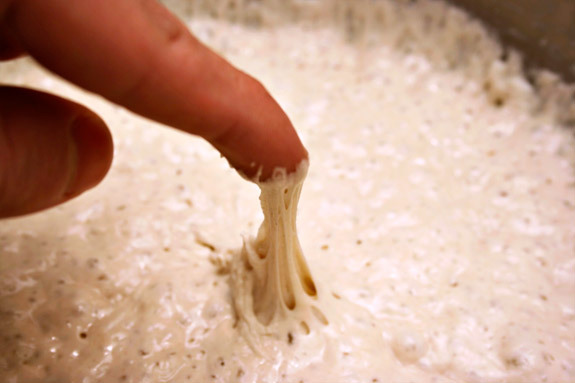 You’ll know the dough is ready because the surface will be dotted with bubbles. 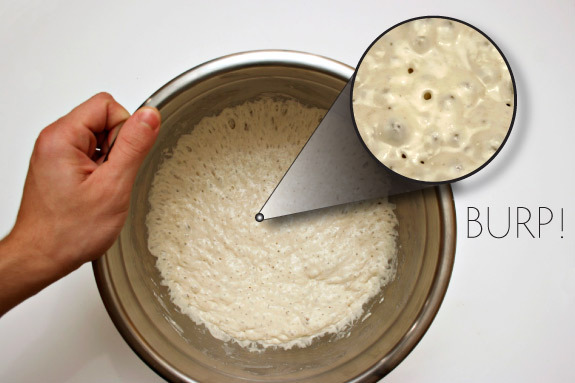 On a lightly floured surface, invert the dough and fold it over itself once or twice. Make sure your hands are also coated with flour because the dough will be very sticky at this point. Cover loosely with plastic wrap and let rest for about 15 minutes. Gently and quickly form the dough into a ball. Generously coat a cotton towel with flour, wheat bran or cornmeal; place the dough seam side down on the towel, sprinkle with more flour, wheat bran or cornmeal and cover loosely with another cotton towel. Preheat your oven and cooking vessel (cast-iron, enamel, Pyrex or ceramic) to 550 degrees. After the dough has risen for 2 more hours and has doubled in size, invert the dough into the preheated cooking vessel so that it bakes seam side up. Cover with the lid and bake for 30 minutes. Uncover and bake for another 15-30 minutes, until the loaf is golden brown. 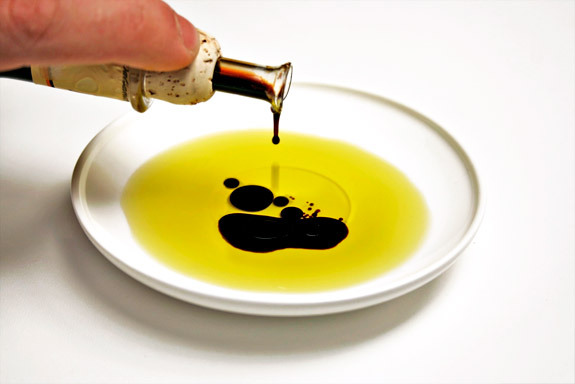 note: The dipping oil is simply extra virgin olive oil, high quality balsamic vinegar, salt and pepper. Posted in French, Italian, recipe, savory by Antonio Tahhan on October 25th, 2008. You can follow any responses to this entry through the RSS 2.0 feed. You can leave a response, or trackback from your own site. Your results certainly make it worth it! Love that balsamic too! I love making that bread. Did not try the quicker version yet. What I like about the bread is the crust & the crumb structure (as you said). The only thing I found was that the middle was a bit wet kind of chewy. Did this happened to you? i saw the faster no knead bread too. since i never made the original when it came out i decided to save the recipe for later. i see now i have to get this done. wonder how i can add some pistachios to it? hmmnn! Is it really that great? I was always skeptical, but it looks delicious. I have a really great balsamic on the list of thing I need to get, but haven’t yet found a purveyor I trust. Looks delicious! Tony, I was about to offer to bring some good olive oil over but you beat me to it…warm bread and oil…the best! I have made brioche with the Artisan bread in 5 minutes a day recipe and loved it, Tony. I love how crusty your bread is! My favorite way of having bread like this would be dipped in olive oil, like you did, but replacing the aceto with sea salt… Yum! I think I just had a bread-gasm. Like you I have doubts about no-knead bread cuz I’m used to kneading them by hands. Having looked at yours, I might very well start making one these couple of days since on working days, I can’t afford the time waiting for the dough to rise. I can see the attraction in a “no-knead bread” but for me this defeats the purpose of making bread in the first place as I find kneading bread is one of the great things in life. No matter how stressed I am I always know that making a simple little foccacia will take it all away. Having said that this bread looks amazing and combining any bread with good olive oil and balsamic is one of the great treats on this earth! Spending that much on balsamic might seem insane to some but having tasted similar vinegars I am 100% with you on this one! Also having just re-read the comments @nate breas-gasm is one of the best culinary sayings I have ever heard and one I will be stealing! i could eat my weight in bread. bread-gasm…hahahaha! This bread looks amazing! 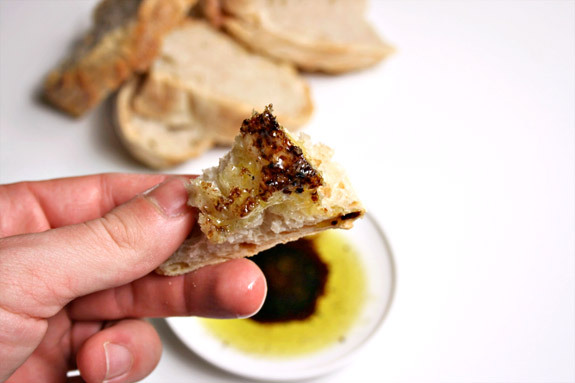 We had an Italian dinner the other night at home and we dipped our bread in olive oil, Parmesan cheese and pepper. Always a favorite of ours! Your blog is making me hungry! Which says a lot, because I just ate a very large dinner. Good stuff here! I can’t wait to read more. 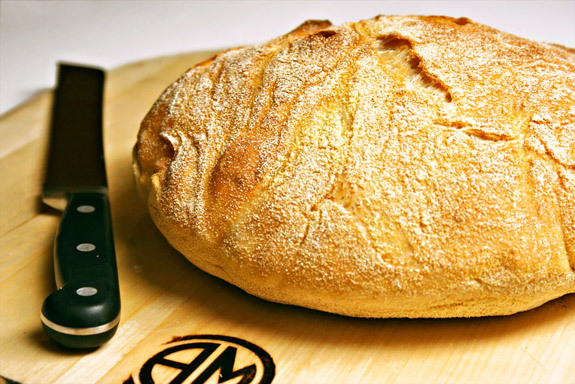 Mmm, there’s nothing better than good crusty bread with fruity olive oil! Good idea to add that touch of balsamic vinegar as well (very nice photo!). But I suspect we’ll stick with olive oil only, not having access to the black gold you have. My brother-in-law was just raving about this no-knead bread a couple of weeks ago. Like you, I was (and I confess, still am) a skeptic about the technique. Not to mention that I actually like kneading. The only thing that I still wonder about is whether the crumb is overly moist. Did you slice into it when it was still hot out of the oven or did you wait til it had cooled and then reheat it? I’ve also had really good luck with this recipe. I found it works better in my 4 qt stainless steel pot, make a nice high loaf. I’ve also had a lot of luck adding things like rosemary, raisins/cinnamon/walnuts/brown sugar, flax etc. Your “crumb structure” is much nicer than mine though. I have crumb envy. Hey Tony, I tried this bread in a very disbelieving frame of mind, but the results are amazing! Particularly living in a country above the wheat line in Europe where there is no good bread to be found….. Here is the recipe: a little different to yours in that after mixing the ingredients and initial rising for a couple of hours at room temperature, the dough is placed in the fridge overnight. The recipe is fairly exact however and you can’t deviate! Hi, thanks so much for the info on traditional balsamic vinegar. We plan to travel to Italy soon and will definitely make visiting L’Acetaia di Giorgio one of our priorities!